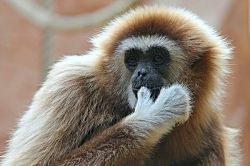 This article about primates for SFF writers is part of the Science in Sci-fi, Fact in Fantasy blog series. Each week, we tackle one of the scientific or technological concepts pervasive in sci-fi (space travel, genetic engineering, artificial intelligence, etc.) with input from an expert. The monkey sidekick is a relatively common trope in media. We’ve seen the friendly shoulder capuchins in Pirates of the Caribbean and Indiana Jones. Rafiki’s antics are ingrained in our minds from The Lion King. And who can forget Curious George, or those “damn dirty Apes” in the Planet of the Apes? Though we see these fun characters often in movies, these animated animals don’t pop up as often in novels. Perhaps this is because most people only have exposure to these animals through exhibit glass at a zoo, and aren’t comfortable writing about them? Let’s remedy that! Two main attributes will help us nail characterizations of nonhuman primates (NHPs): size and behavior. The number of ways to differentiate non-human primates can be dizzying. Simian vs Prosimian. New World vs Old World. Monkey vs Ape… in order to determine what species you’d like to write about, begin thinking about how large you want this animal to be. APES are where humans fall, taxonomically. 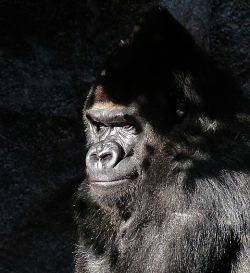 This branch includes the great gorilla, chimpanzee, orangutan, and bonobo, as well as the lesser gibbons. These species are fairly large (~30 – 150 kg, dog-to-human-sized), have nails rather than claws, and do not have tails. If your sidekick needs to be large or humanoid, you may want to study the apes for inspiration. Factoid! Ham the Astrochimp was the first hominid launched into space (beating cosmonaut Yuri Gagarin by a few months), which is pretty interesting sci-fi fodder (and possibly an inspiration for one of the Planet of the Apes remakes…) Other famous apes include the gorillas from Tarzan, and King Louie from the Jungle Book movie adaption. 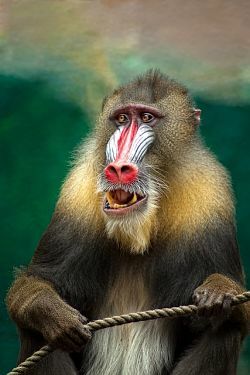 MONKEYS consist of a huge variety of animals, with sizes ranging from the pygmy marmoset weighing as little as 100 grams, to the mandrill weighing up to 40 kg. 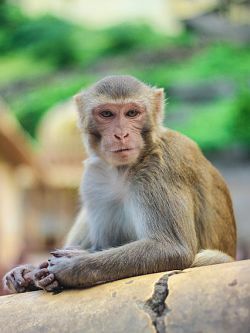 Monkeys are generally classified as “New World” (NW; origins in tropical South and Central America) or “Old World” (OW; origins from all over Africa and Asia). This designation also gives some clues as to physical characteristics. New World monkeys have flat noses and sideways-facing nostrils (platyrrhini), whereas Old World monkeys have down-turned nostrils (catarrhini). New World monkeys have prehensile tails, which have a type of skin that allows them to grasp objects (helpful when living in trees). 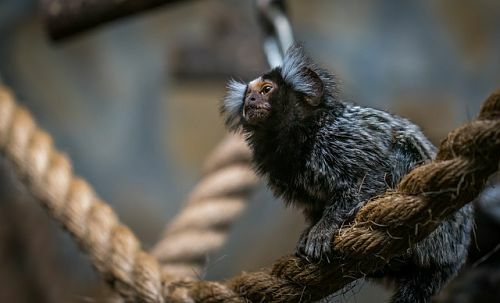 While some Old World monkeys have tails (not all do), they are not prehensile tails. For example, the capuchin monkey famous from Indiana Jones or Pirates of the Caribbean is a New World monkey. Factoid! 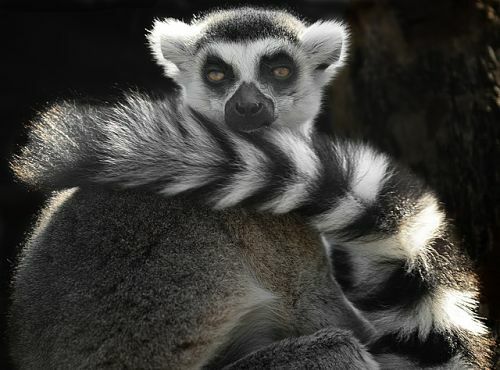 Lemurs are not monkeys. They’re not even simians! They branch off higher on the taxonomic tree, before the simians (apes and monkeys), and are considered more primitive prosimians. Therefore, lemurs are simply lemurs. It’s hard to classify NHPs by physical characteristics alone, but at least with behavior we can make some universal generalizations to help write a realistic character. Far and away, most NHPs are social, and they exist in a variety of complicated (and often violent) social hierarchies. They depend on this social interaction; lacking it can have major negative impacts on their mental wellbeing. They will likely want to bond to some sort of companion, and that interaction can be exhausting to anyone put in that unique position. Another interesting physiological aspect of these animals that can complicate a novel plot is that many diseases are transmissible between NHPs and humans. 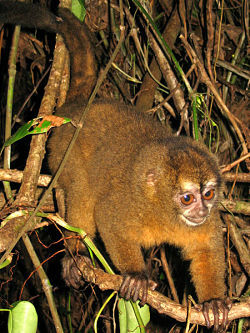 Diseases that show no signs in NW monkeys might cause fatal disease in OW monkeys. Diseases that have evolved with African OW species could decimate Asian OW species. 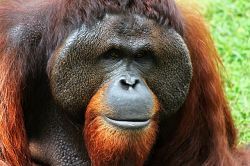 Even diseases that are harmless in one species of a family (OW, NW, or ape) can be fatal to another species of that family. And, of course, some of these diseases can move between humans and NHPs. For example, humans are the likely source for measles in monkeys, and researchers believe that humans acquired human immunodeficiency virus (HIV) from a series of exposures to simians with simian immunodeficiency virus (SIV). In some areas of the world, NHPs even compete with humans for resources and raid fields of crops. Suffice it to say, if NHPs are going to be a part of your plot, they can impact your world-building in more far-reaching ways than just as a simple sidekick. When considering whether to add NHPs into your novel, it may be helpful to tackle the problem by first nailing down what size or other physical attributes you’d like this animal to have. From there, certain aspects of behavior can target which species to research when writing your character. NHPs are wonderful. 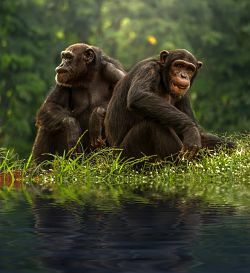 I hope this has inspired you to write stories of alien forests filled with troupes of howler monkeys armed to the teeth and ready to defend their territory against an advancing human army, or cybernetically-enhanced bonobos exploring the fringes of space–or perhaps your NHPs are the origin of a rogue virus? Why not? For a real-world example of how NHPs and humans live together and impact one another, I recommend “Cities”, episode 6 of BBC’s Planet Earth 2. Author’s note, January 24, 2018: Today, researchers announced that they have successfully cloned a primate (a macaque monkey). For me, that statement is like science fiction coming true, like sensing the future being made. I can only begin to imagine the impact that this feat will have on the world: medically, ethically, legislatively–and in fiction. I hope some of you will write about it.